Catalan and Spanish flags at a demonstration against Catalan independence in Barcelona. MADRID - Catalonia's independence referendum has plunged Spain into its most serious political crisis since a failed coup in 1981. After several days of rising tensions, thousands of Catalans line up to vote in the referendum, despite it being declared illegal by the Spanish courts and the central government. Spanish riot police try to block the vote, forcing their way into polling stations to seize ballot boxes and voting material. Shocking footage emerges of police charging crowds at some stations, using batons and rubber bullets and roughing up voters -- sometimes elderly. Catalonia says 893 people received medical attention, a figure disputed by Madrid. Catalan leader Carles Puigdemont says "the citizens of Catalonia have won the right to an independent state in the form of a republic". But Prime Minister Mariano Rajoy insists: "There has not been a self-determination referendum in Catalonia. The rule of law remains in force with all its strength." The Catalan government claims 90 percent of voters backed independence on turnout of 42.3 percent, with parties opposed boycotting the vote. The European Commission calls on Madrid and the separatists to hold a dialogue, while the United Nations urges Spain to investigate the violence. Puigdemont demands the withdrawal of national police from Catalonia and calls for international mediation. Several thousand people march in Barcelona and other Catalan towns to defend the referendum and denounce police violence. A general strike called by more than 40 unions, political and social groups, disrupts Barcelona's port, transport and some businesses. Up to 700,000 people demonstrate in the Catalan capital. King Felipe VI accuses Catalan leaders in a televised address of threatening Spain's stability and urges the state to defend "constitutional order". Puigdemont says his government is preparing to proclaim independence, perhaps at "the end of the week". A source in the Catalan government tells AFP the declaration could be made October 9 during a regional parliamentary session. The Madrid stock market tumbles as rattled investors dump Spanish shares. Spain's Constitutional Court orders the suspension of the planned Catalan parliament session. Banco Sabadell, Catalonia's second largest bank, announces it will relocate its offices outside the region. Several other companies follow suit. Puigdemont delays an appearance in the regional parliament until Tuesday. Madrid's Catalan representative apologises for the first time for the police violence during the vote. 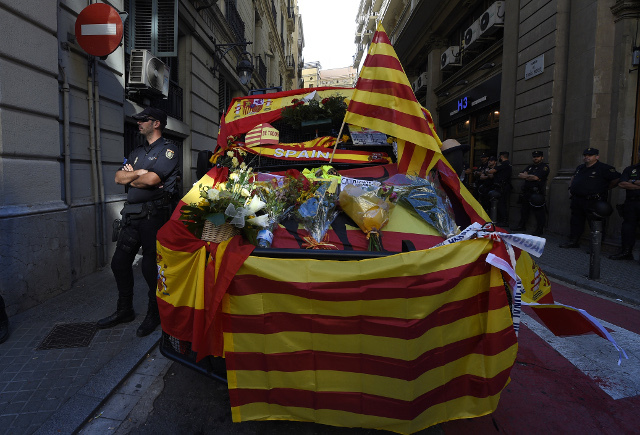 In Madrid, pro-independence leaders are released after facing court on sedition accusations. Tens of thousands of people, some dressed in white, demonstrate in several Spanish cities, as well as the Basque Country, demanding dialogue to resolve the crisis. In a newspaper interview, Rajoy refuses to rule out suspending Catalonia's regional autonomy unless its leaders withdraw the threatened independence declaration. More than 350,000 people, according to local police, march in Barcelona to defend a united Spain while organisers put turnout at between 930,000 and 950,000. Puigdemont hints that the region would declare independence if Madrid continues to refuse dialogue. "The days are going by and if the Spanish state does not give a positive response, we will do what we set out to do," he tells Catalan television. Catalonia's independence referendum has plunged Spain into its most serious political crisis since a failed coup in 1981.